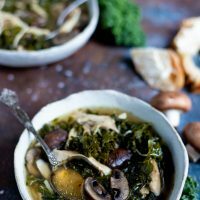 Perfect for a cold winter day, this Instant Pot Chicken Soup with Mushrooms and Kale is super quick to make but has an all-day taste thanks to the pressure cooker. 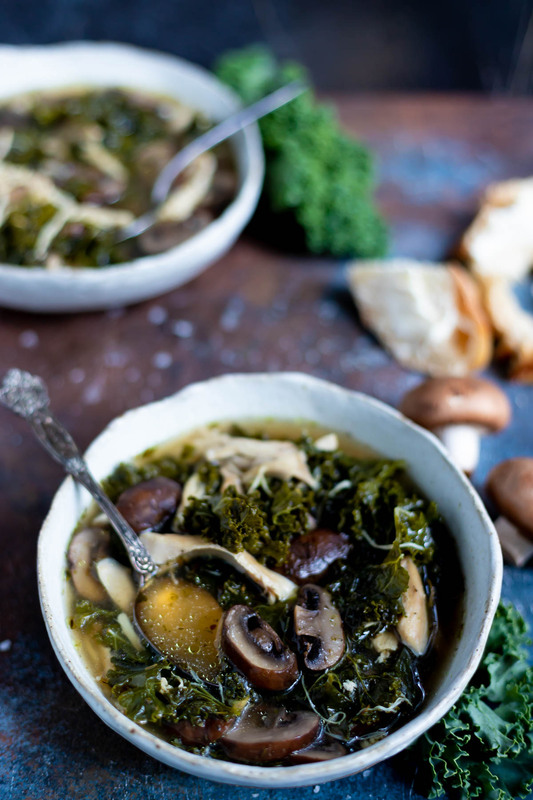 This healthy soup recipe is great for dinner, lunch or meal prep. It is Keto, Paleo and Whole 30 friendly as well as gluten free and dairy free. Step 1: Pressure cook chicken thighs in water on high for 20 minutes. Release pressure, remove chicken and let cool. Debone chicken, strain broth and return both to pressure cooker. Step 2: Add all remaining ingredients. Pressure cook on high 1 minute. Step 3: Release pressure and serve. This is a quick soup recipe and only pressure cooks the chicken for 20 minutes to create a nice broth. See my recipe for Pressure Cooker Chicken Bone Broth for a deep stock option. That broth is pressure cooked for over an hour. 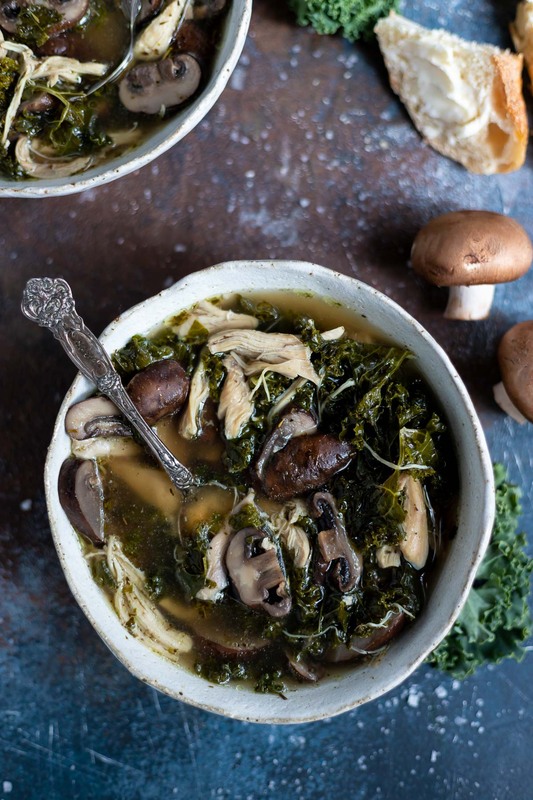 For the purposes of a quick dinner, this soup is cooked just long enough to ensure the chicken is done and the broth is flavorful. I’ve been using an Instant Pot for about 6 months now (I was a hold out 😆). I have found that some recipes do in fact makes sense in the pressure cooker while others do not. 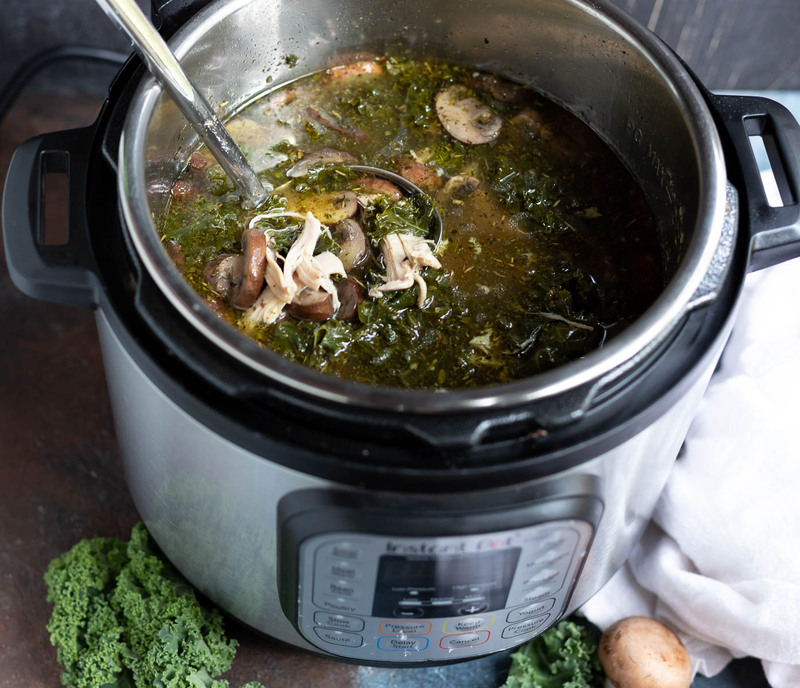 Things like soup, stews, shredded meats and sauces do well in the Instant Pot because you get that all day cooked flavor in a short amount of time. I have found that cooking most vegetables in the Instant Pot actually takes longer due to the time it takes to pressurize. 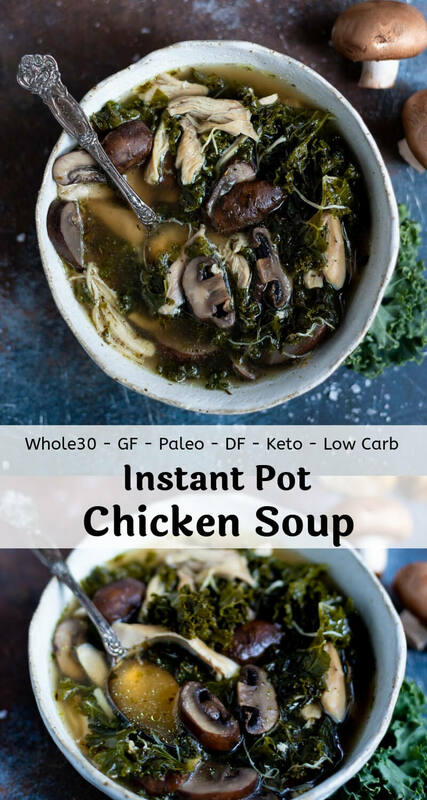 But, for meals like this Instant Pot Chicken Soup the pressure cooker is fantastic! Place chicken thighs and water into pressure cooker. Attach lid and set valve to sealed position. Pressure cook on high for 20 minutes. Manually release pressure, remove chicken and let cool enough to handle. Debone chicken and remove skin, strain broth then return shredded chicken and broth to pressure cooker. Add all remaining ingredients. Attach lid and set valve to sealed position. Pressure cook on high 1 minute. Manually release pressure. Salt and pepper to taste. Serve. *If you do not want to use store bought chicken stock, start the first step with 8 cups of water instead of 4.